Seattle Symphony Double Bass Travis Gore loves being in the moment, whether in the surf or playing bass with one of his bands. 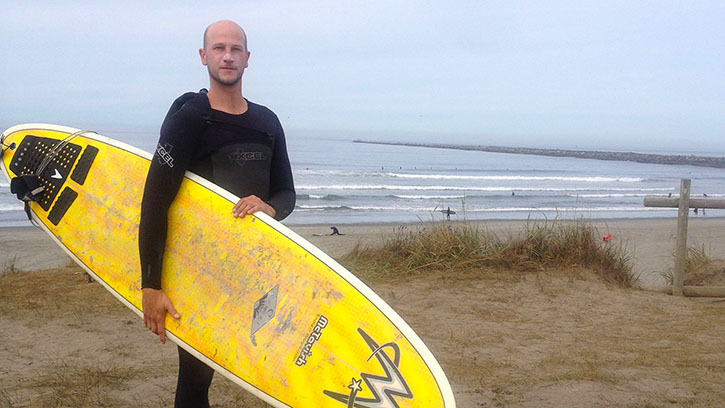 When he’s not with his growing family or playing with the orchestra, you can find Travis Gore surfing on the Washington coast playing with bands around Seattle. His personal project is a group called Feeds on Majesty, but he’s also appeared on a record by Hey Marseilles called Lines We Trace and on Bryan Appleby’s The Narrow Valleys. Travis remembers watching his father play drums with rock bands in Chicago and around the Midwest. “My dad was a huge influence on me getting into music,” he recalls. Through the caring support of our donor family, the Seattle Symphony is able to attract and retain world-class musicians like Travis. Join the community of supporters who make our music possible with your donation today!